Engineering staff work on a two-year road and utility reconstruction project on Pleasant Avenue and Glen and Binscarth Roads in Kitchener. The city’s water is supplied by the Region of Waterloo, which shares responsibility with Kitchener Utilities for water supply and treatment. Along with that role, Kitchener Utilities is also responsible for maintaining the city’s network of pipes and valves serving 60,000+ customers. CUI reached out to Kitchener’s director of engineering, Hans Gross, to get a sense of the municipality’s strategy for infrastructure replacement, condition assessment, recent projects and the city’s upcoming water and sewer priorities. CUI: How old is the city’s water infrastructure? This refers to drinking water/ stormwater/ sanitary sewer pipes. CUI: What technologies has the city utilized for pipe replacement/ rehabilitation? Eg. open cut, cured in place piping (CIPP), spray on linings, pipe bursting, etc. Hans Gross: The methods that Kitchener has employed up to this point include: open cut, pipe bursting, directional drilling, microtunnelling, and CIPP lining. The majority of focus historically up to now has been on open cut, typically performing 4 to 6 kilometres of open-cut replacement annually for each of the storm sewer, sanitary sewer, and watermain assets. Replacement of mains by pipe bursting is much less common, typically only being performed on an as-needed basis when determined to be the best technical solution to a specific issue. Pipe bursting is, however, commonly used for service laterals for sanitary sewer and water. Sanitary sewer main rehabilitation by lining is typically accomplished at an annual rate of 1.5 to 3 kilometres and watermain closer to 1 kilometre; however it is envisioned that at a point in time within the next 10 years, the share of trenchless treatments will grow as a proportion of the overall remediation work to our underground infrastructure (see the last paragraph in this report). Lastly, Kitchener has an annual open-cut spot repair program that has remediated an average of 36 point failures of sanitary sewer main per year. CUI: Can you give some recent examples of water/sewer infrastructure rehab projects the city has been involved in? Hans Gross: In Kitchener, rehabilitation for both sanitary sewers and watermains is delivered in an ongoing basis through individual trenchless cured-in-place lining programs for each type of main, and lining for sanitary services as well. Both programs operate within fixed annual budget envelopes, and work to accomplish as much work as the annual winning tender bidder can provide for their price within that envelope. Under this type of operating approach, there is no “big project” to give an example of, but rather an ongoing steady approach that addresses need at a pace (as mentioned above typically 1 to 3 kilometres of main per year) dictated by available annual funding for this type of work. Generally speaking, locations selected for rehab work are done on a priority basis based on known condition, maintenance history, and suitability for the types of treatments delivered by these programs. CUI: How much of the infrastructure has been replaced versus what needs replacing? 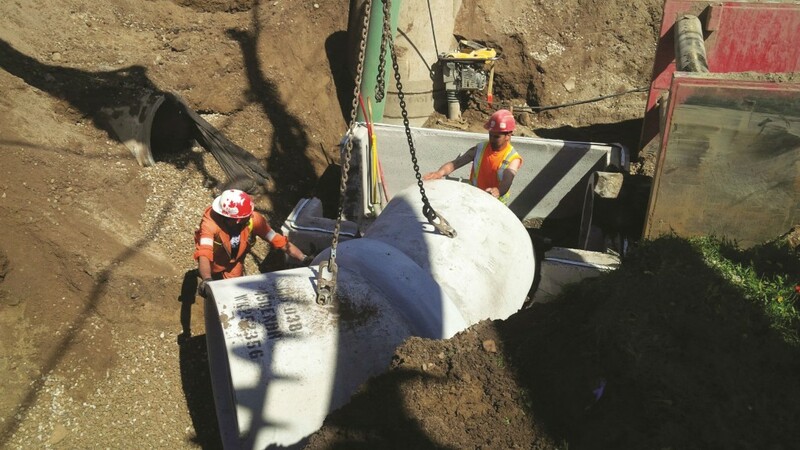 Hans Gross: Kitchener’s preferred method for underground infrastructure replacement is by open-cut replacement of all infrastructure types that lie within an identified segment of right-of-way at the same time as part of a single project. Kitchener has been replacing underground infrastructure in this manner since the early 1970s. In the time between then and now, approximately 125 kilometres of road right-of-way (which is comprised of all components of the sanitary sewer, storm sewer and watermain systems, as well as pavement, curb and sidewalk within the right-of-way) has been replaced. According to our most recent data, 33.8 kilometres of our sanitary sewer network, 40.4 kilometres of our storm sewer network, and 24.9 kilometres of our watermain network have condition scores that would make them eligible right now for further examination as candidates for replacement. This would represent in the simplest of terms our “backlog” of replacement needs. Defining how much infrastructure needs replacing annually or what the additional “backlog” of replacement needs are is not however a static figure; all infrastructure deteriorates over time and thus has a lifespan, so in any given year an additional aggregate of infrastructure passes into eligibility for replacement. This is offset to some extent by the amount of infrastructure replacement that is concurrently occurring on an ongoing basis. This represents the dual nature of the infrastructure deficit: the need to keep up infrastructure replacement work at a rate sufficient to offset the natural rate of ongoing infrastructure deterioration, and at the same time address the existing replacement backlog of infrastructure whose condition has for some time presented an undesirable risk of loss of service due to condition. CUI: What are the priority areas? (either geographical by neighbourhood, or type of asset eg. manholes, watermains, sanitary sewer mains, laterals). • The asset’s assessed current condition and/or performance, coupled with the accompanying level of risk associated at that condition for the asset to be able to continue to provide service at defined levels. • The risk associated with the impact of loss of service on the customer base, as defined by the location of customers with higher than average sensitivity and impact to a loss of service. • Locations within the asset’s network where maintenance activities and costs are inordinately high. As for what specific types of assets receive primary focus for replacement, as answered in a prior question the preferred approach of Kitchener is to replace all municipal assets (sanitary sewer, storm sewer, watermain, pavement, curb and sidewalk) within an identified stretch of right-of-way at the same time as part of a single reconstruction project. In doing so, no preference is given to a specific asset type or component within that identified replacement zone, as all are replaced on an equal basis. The identification and prioritization process for these right-of-way segments will however give greater weighting to the need of the deeper infrastructure. It must be stressed that only right-of-way segments where most or the entire assemblage of asset types within them are in need of replacement will be addressed in this manner. In locations where only one or two asset types are in remediation need, they are likely to be addressed through one of the dedicated rehabilitation and/or maintenance programs currently in place for individual asset types. CUI: Will Kitchener have to raise rates to pay for water/ sewer infrastructure? An article in The Record last August said the city was considering rate hikes of 7 to 10%. Hans Gross: In August of 2015 a “State of the Infrastructure” report and presentation was made to city council concerning the need to accelerate the rate of replacement of underground infrastructure (especially water and sanitary sewer infrastructure), and included proposed utility rate increases necessary to support the recommended rate of acceleration. Council approved those proposed increases in January of 2016 as part of the City’s 2016 budget and 10-year capital forecast. The 2016 rate increases amounted to 7.6% to water, 9.2% for stormwater, and 10.8% to wastewater. This will result in a 13% increase in funding for replacement work, as well as a 2% increase for maintenance work. It is anticipated that such increases will continue annually in order to support further acceleration of this work. CUI: Does Kitchener have an asset management program? If so what is specifically involved? Eg. condition assessment using CCTV cameras, leak detection using technologies to detect leaks? • Capital planning for its water, wastewater, and stormwater assets exclusively based on data driven decision making tools that take into account over a dozen separate parameters including observed conditions, calculated condition, maintenance history, capacity modelling, risk modelling, and lifecycle modelling. • Incorporation of more advanced work management applications and practices into the overall business practices for maintenance for each underground asset class. This includes codifying levels of service (where they still remain unofficial), defining work processes and measurable units of work, and understanding full cost accounting for the operations and maintenance aspect of the management of each asset class. • Long-term life cycle costing for both asset physical and financial sustainability. CUI: What is on your radar for the next phase of underground infrastructure replacement for Kitchener? Hans Gross: The next phase and challenge for underground infrastructure replacement activities is to increase the tempo of open cut replacement work in the next five-year timeframe. The earlier noted approved increase in the future budget profile for this work will result in an increase to the annual replacement rate for watermain, sanitary sewer, and storm sewer in five years to 14 kilometres each annually – nearly triple the current five year average annual replacement rate. 150-mm watermain being installed under the storm and sanitary mains at the intersection of St. Clair and Glen in Kitchener.